In Bed, Wed, Dead a roll of the dice will give you 3 names, and then the rest is up to you! Will you choose to wed Maid Marian and murder Morgana? How about one night with Jimmy Fallon vs. a lifetime with Jimmy Kimmel? There's no easy choices, only easy laughs as your friends watch you struggle while wagering on what you'll decide. Featuring 300 cards in different categories with more than 3,000 names plus blank cards for you to really make the game your own. 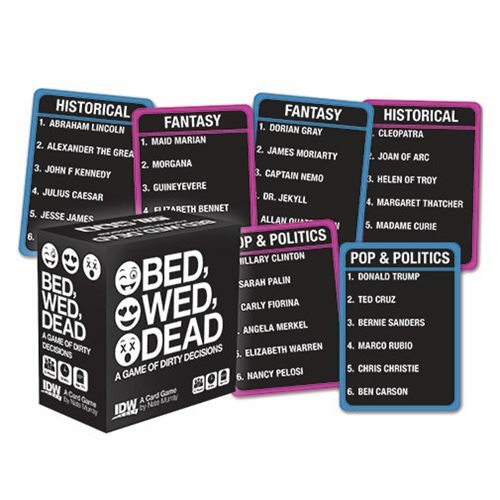 Bed, Wed, Dead Game will having your rolling with raucous laughter. Requires 2 plus players. Ages 17 and up.